We are celebrating International Volunteer Day #IVD2018 with a tribute to the Midlothian Football Team. 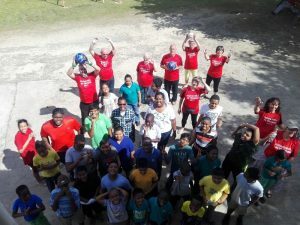 In November 2017 twelve members of Midlothian Walking Football Team visited Trinidad and Tobago. They were on a journey of a lifetime – coming to the Caribbean and working with Habitat for Humanity to assist families on a pathway to permanence. The Team was headed by Vivian Wallace, the Ageing Well Coordinator, and the members were both men and women. 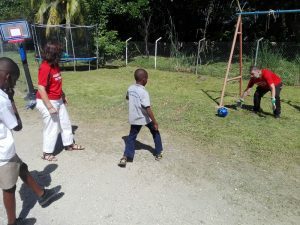 They worked on three Habitat Homes, painting and casting foundations in Central Trinidad and Sangre Grande. They spent time with Strategic Learning & Special Education Institute Limited meeting the children and teaching them the basics of this form of the beautiful game! Walking football is an ideal form of exercise for people with mobility challenges, and is suitable for any age – the youngsters at Strategic were thrilled to be able to score goals against the grownups! Team members also gave several interviews promoting Walking Football as well as the Global Village concept to the wider population. After a week on our sister isle, Tobago the team returned home. This was not the end of their journey as they continue to keep in touch with the families and children they met. Most recently on November 1, 2018, Ms. Wallace and her team presented the Aging Well Programme to the Scottish Parliament. Habitat was highlighted there as they used their trip to demonstrate how the aging population can find purpose in giving back and remain active. 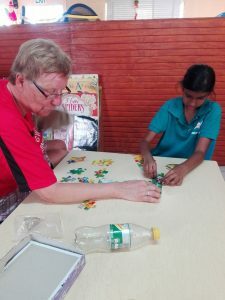 Each year, the United Nations designates Dec. 5 as a day for volunteers and organizations to celebrate their shared missions and promote the work in their communities. Habitat for Humanity is joining the United Nations and other organizations around the world on this day to recognize local volunteers and share stories of their impact. For 2018, International Volunteer Day will recognize volunteers worldwide who contribute to making their communities more resilient against natural disasters, economic stresses and political shocks. The campaign theme will be: Volunteers Build Resilient Communities. This year’s campaign will highlight the role of women volunteering in their communities and the fact that they represent over 50 percent of volunteers worldwide.